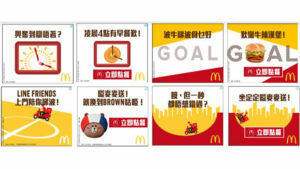 To drive McDelivery orders this World Cup season, McDonald’s, OMD Hong Kong and Google have come together to reach excited football fans when they are most hungry. Through the market-first application of Google’s Real-Time Trigger with a Data Management Platform (DMP), McDonald’s can anticipate the “hungry moments” during matches ahead of the competition and entice fans with their favourite menu items. Based on a simple insight that football fans get hungry when excited, the campaign leverages Google’s Real-Time Trigger technology to push promotional messages along with real-time scores at key moments during a match – i.e. at the beginning, half-time, the end of a game, or whenever a goal is scored. By deploying a DMP, the brand can leverage granular audience insights, such as a favourite purchase item, to deliver more personalised and relevant messaging, away from the clutter of Search advertising.